The Chan Zuckerberg Initiative has announced it will fund the CNAG-CRG Single Cell Genomics team to support the Human Cell Atlas. Holger Heyn leads the selected project that will benchmark 14 different single-cell RNA sequencing methods. Barcelona, 19th April 2018 – The Chan Zuckerberg Initiative (CZI), DAF, an advised fund of Silicon Valley Community Foundation, today announced new funding for 85 projects to support the Human Cell Atlas (HCA), a global effort to map every type of cell in the healthy human body as a resource for studies of health and disease. The grants total $15 million over one year. 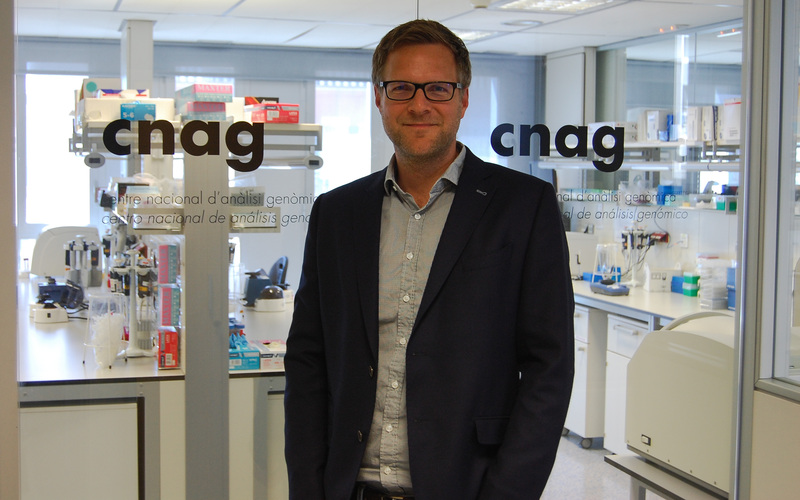 Holger Heyn, leader of the Single Cell Genomics team at the Centro Nacional de Análisis Genómico (CNAG-CRG), heads one of the projects selected for funding. The HCA project gathers scientists around the globe to work together on the fascinating idea of creating a map of cells that built the human body. Latest sequencing technologies are capable of analyzing one cell at a time and thousands of cells per experiment. Creating many such dataset for millions of cells across different tissues and organs will eventually enable drawing a high-resolution atlas of cellular composition. “A human cell atlas will help us to understand the complexity of our body with a resolution that could not have been imagined before” says Holger Heyn, member of the consortium and recipient of the CZI research grant. Most importantly, the atlas will serve as reference map for future work on illnesses, such as cancer or autoimmune diseases, to understand their origin and to identify targets for therapies. In this initial phase of the HCA project, Dr. Heyn’s group now reaches out to identify the technologies that are most suitable to create such a comprehensive atlas of human cells. In the focus, single-cell RNA sequencing methods, which are at the forefront to inform about a cell’s phenotype. However, there are a plethora of conceptionally different methods and it remains elusive which protocols are most adequate to draw a tissue atlas. Before launching into large-scale production efforts, thus, merits comprehensive comparison of single-cell techniques. Within the framework of the CZI funded projects, Dr. Heyn will generate a comprehensive benchmark datasets to systematically evaluate techniques for their power to describe cell types and states. The exercise includes 14 different methods with datasets produced at 18 research centers and companies. “For a fair comparison of techniques, we designed a unified sample at the CNAG-CRG that will now be shipped to the partnering laboratories. This complex sample includes different types of blood and colon cells helping us to simulate real scenarios within the HCA project”, explains Dr. Heyn and adds, “Beyond the initial selection of techniques, our reference sample will be available to benchmark future methods that might be even more powerful than currently available approaches”. This project only got viable through last year’s discovery that single cells can be cryopreserved for single-cell sequencing applications, making it possible to store and transfer samples between laboratories. During the last year, Dr. Heyn’s group improved their protocols and produced more than a hundred vials of the cryopreserved HCA reference sample. “These tubes will be now shipped on dry ice to our partners who will perform their established protocols to isolate and process single cell” says Dr. Moutinho from the Heyn lab, who was leading the sample preparation effort. All projects selected for funding by CZI focus on developing open computational tools, algorithms, visualizations, and benchmark datasets to enable researchers around the globe to work with the large variety of molecular and imaging data generated by scientists working on the HCA project. The grantees will also collaborate with each other, and with CZI’s scientists and software engineers, to maximize the impact of the new tools and technologies. The Human Cell Atlas will contain petabytes of data on billions of cells and tissue sections across multiple modalities used by hundreds of labs around the world. A project of this scale and complexity demands an open, modular, and extensible approach to coordinating, standardizing, and sharing data. “HCA want to make this data open and accessible to researchers, enabling the scientific community to innovate rapidly without barriers to data access. The HCA Data Coordination Platform faces this challenge and counts with a Governance working group dedicated to oversee the implementation of its policies with an eye towards open science and open data,” explains Roderic Guigó, coordinator of the Bioinformatics and Genomics Programme at the Centre for Genomic Regulation (CRG) in Barcelona, Spain, and member of the HCA Data Coordination Platform Governance Group. Over the course of the next year, the grantees will work together and share progress to coordinate efforts and maximize the usability of these tools. Working with CZI’s science and software engineering teams, they will work to bring these tools to the broader scientific community and where appropriate, link them to the HCA Data Coordination Platform.